The WinForms Charts include support for 40+ chart types such as line chart, bar chart, pie chart, area chart, financial charts, etc. Its rich feature set includes zooming, panning, tooltip, crosshair, trackball and drill-down functionality. 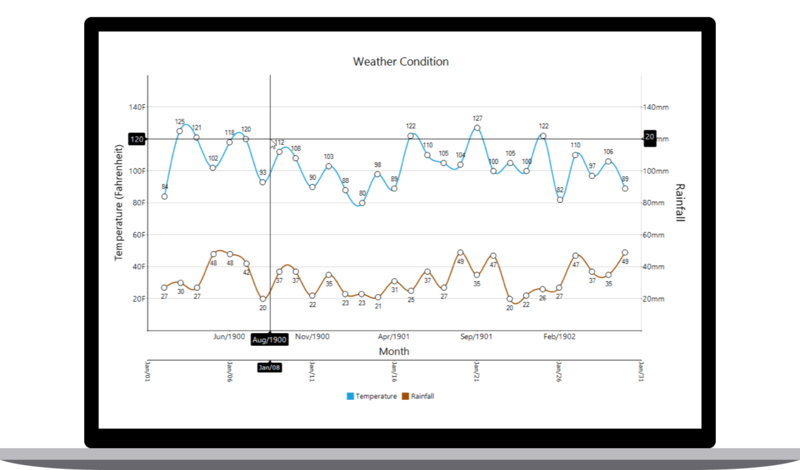 The WinForms Chart control is used to add beautiful charts in desktop applications. It contains a rich gallery of 40+ charts and graphs, ranging from line to financial charts, that cater to all charting scenarios. Its high performing quality helps to render a large amount of data quickly. It also comes with a lot of features such as zooming, panning, tooltip, crosshair, trackball, drill-down, and events to make the charts more interactive. Plots more than 40 chart types, ranging from basic charts like such as line, and column etc. to financial charts like such as candle, and OHLC. Each chart type is easily configured with built-in support for creating stunning visual effects. The end user experience is greatly enhanced by including a set of user interaction features such as zooming and panning, crosshair, trackball, interactive cursor, drill-down, events, tooltip and fancy tooltip. Chart plots any type of data in a graph with the help of different axes types: numeric, category, and date-time axis. These chart axis elements can be customized further to make an axis more readable. Legends allow users to display additional information about the chart series. The legend can be customized and positioned anywhere in the chart region. Supports rendering the chart in 3D mode. You can also rotate or tilt the rendered 3D chart programmatically. The depth of the z-axis can also be customized. Built-in context menu and toolbar is provided in the chart to perform various actions on run-time. Allows you to customize the appearance of any part of chart using built-in properties. And comes with several built-in themes, skins and palettes. Export the chart as an image, PDF, Excel, Doc and in XML formats. Also, import the chart from an excel file or from an XML file.